We invite you to conduct business with Wisconsin's finest independent insurance agents in a welcoming, energized atmosphere. The IIAW understands that agents and carriers alike are continuously on the lookout for fresh perspectives and new ideas. InsurCon2019 will feature world renowned speakers and experts such as Jim Abbott, John Maketo, Charlie Berens & others to provide attendees with actionable intelligence and a convention experience unlike any other. InsurCon2019 will also offer a wide variety of relevant seminars for continuing education credits and networking events. Enjoy a relaxed atmosphere as you network and engage with like-minded professionals. Early Bird Pricing until Mar 31st! 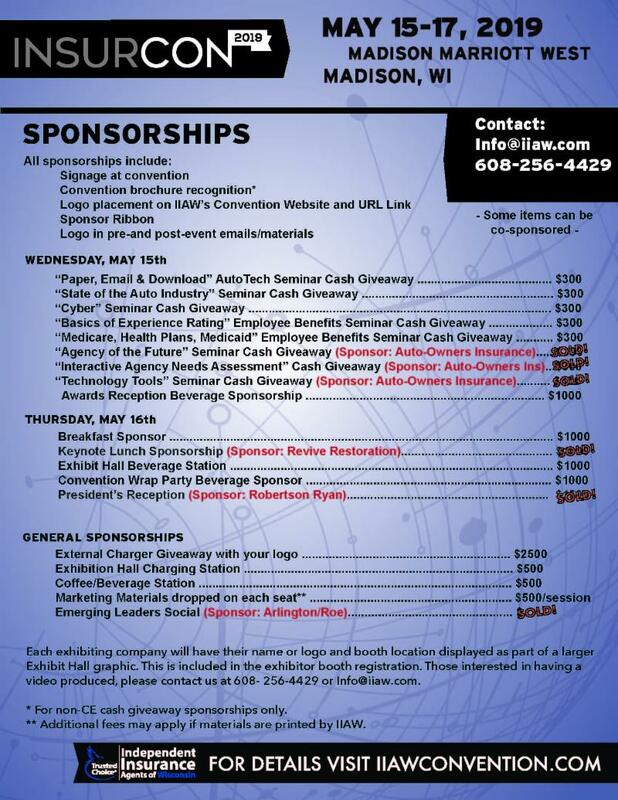 NEW this year are the IIAW's additional sponsorship opportunities. Available for purchase, these sponsorship opportunities are the perfect alternative to company hospitality hours. Please see below for all available sponsorship options and do not hesitate to contact us with any questions or outside-the-box promotional ideas. We have enjoyed outstanding participation in the past and this year will be no exception. Last year's event was an amazing success and we expect our 120th birthday event to be even better. We are excited to host our many familiar exhibitors along with the new companies that offer valuable products and services to our members. Reserve your booth today! As a friendly reminder, please conduct your agent entertaining during the designated company hospitality hours from 6:00pm- 9:00pm on May 15, 2019. DON’T MISS the final hour of the Showcase - IMT will be sponsoring a $100 Cash Giveaway every 5 minutes for the final hour!!!! *To view updated booth availability, click below to register!